MEGA provides a completely private cloud storage experience, combined with easy to use features and great looking apps. Mega has 50GB free cloud storage and synchronize folders on your PC. You also can access your files on mobiles with its grate mobile apps. If you have some movies on Blu-ray discs, you may want to get them to Mega then you can watch Blu-ray movies on on your phone, tablet, and more. To get the work done, firstly you’ll need to rip and convert Blu-ray to digital file format like MP4, MOV or other format compatible with Mega. To rip Blu-ray for uploading Mega, a Blu-ray-ripping utility is essential. The best program we high recommend is Pavtube BDMagic. which can help you remove all the restrictions of Blu-ray (DVD included) and convert Blu-ray to to MP4, MOV, AVI, MKV, etc popular formats with smaller size then you can store more Blu-ray rips on Mega. 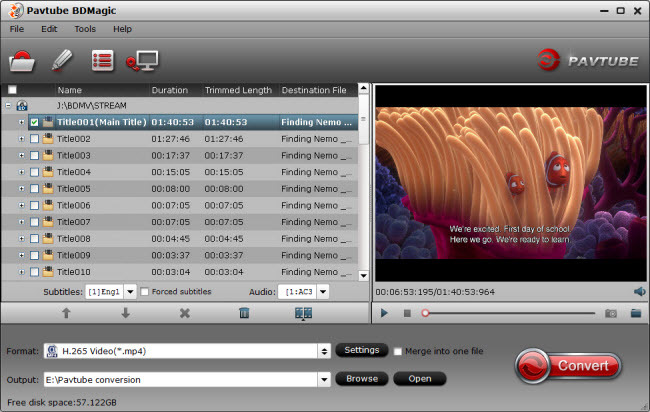 For the video size limit of Mega site, the built-in editor also allows you to extract Blu-ray clips with the very part you want. Or, you can just choose to rip certain chapters of a Blu-ray as you like. If you’re using a Mac, simply turn to Pavtube BDMagic for Mac, which allows you to get Blu-ray to Mega on Mac OS X (including 10.12 macOS Sierra, 10.11 El Capitan, 10.10 Yosemite and 10.9 Mavericks). Now download the right version and follow the tips below to finish your task. How to add Blu-ray to Mega with suitable format? Run the Blu-ray to Mega software and click “BD/DVD disc” icon to load Blu-ray movies for converting. You can also import movies files from Blu-ray folder, ISO image files. 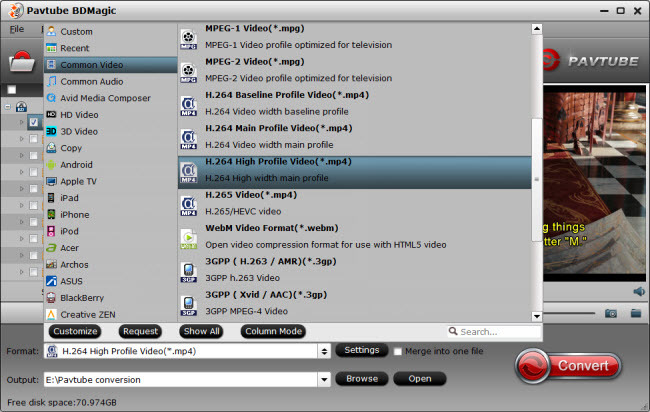 Click “Format” and through the profile to select Mega highly compatible format like MP4, MOV from “Common Video” profile list. For those who wanna upload Blu-ray files to Mega and share on tablet or phones, you can choose a certain preset like iPad as target format. Tip: If you need, you can also click “Settings” to modify parameters of your output profile to meet your professional needs: bit rate, frame rate, aspect ratio, etc. if you want to shrink Blu-ray to a smaller size, you can downsize the video bitrate. After all settings, click “Convert” button to rip Blu-ray to Mega. When the process finishes, open the output folder to locate the generated file. After the conversion, move your files into your Mega by dragging and dropping them into your Mega folder. Now it would be available for you to view on other computers, Android, Apple devices or share with your friends anytime, anywhere just with the help of your Mega.